Students bring their Henson-funded puppet creations to the stage. Sylvia Plath might not have made much sense as a Muppet—try imagining Fozzie Bear in an adaptation of “The Bell Jar”—but that doesn’t mean she can’t work as a puppet. 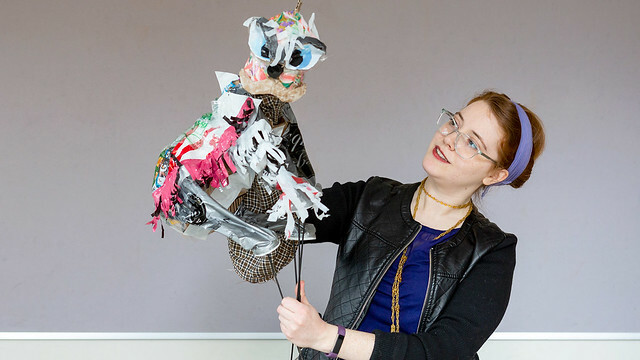 With long, foreboding black arms and a variety of faces (including one birdlike mask), the famously troubled poet takes puppet form in “Dear Sylvia,” a one-person performance piece created by Olivia Brann ’14, M.A. ’19. “Dear Sylvia” is part of tonight’s Henson Awards Showcase, a celebration of the student recipients of the Jim Henson Fund for Puppetry, named for the renowned Muppets creator who graduated from UMD in 1960. Puppeteer Jane Henson ’55 (Jim’s wife) started the fund that annually supports four students’ puppet projects. The topics aren’t the lighthearted stuff of Shari Lewis and Lamb Chop: Mental illness, pollution, grief and Jungian psychology are all on the table.